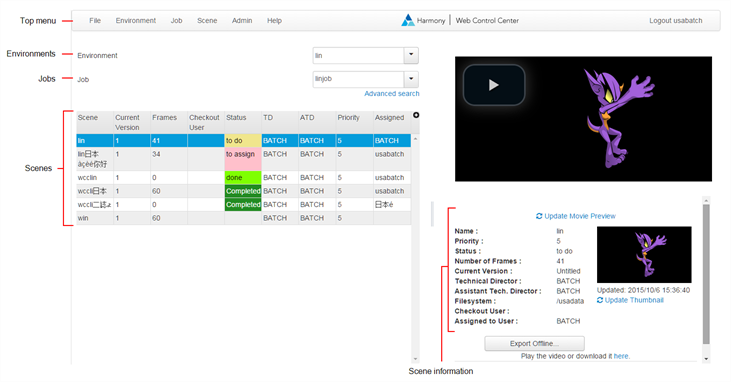 To manage a production, you will need the WebCC. WebCC is used to create new environments, jobs, scenes and users, as well as to import and export scene packages. WebCC directly manages your server database. Top menu Contains all the commands available in the WebCC. You can also find the commands in the contextual menus available in each area by right-clicking. Displays the sequences or episodes in your project (Environment). You can only see your jobs when you select a project from the Environments list. Displays the scenes in an episode or sequence (Job). You can only see your scenes when you select a job from the Jobs list. You can also see who checked out the scene, as well as the number of versions and frames. Click the Add Column button to add information columns to the scene list such as Current Version, Frames, Checkout User and Priority. Displays information on a selected scene, such as the name, priority, technical director and user who checked the scene out. You can also preview the scene's thumbnail and rendered clip of selected scenes. When you select a scene that has no thumbnail available, the request is sent to the Harmony database to create it. But first, batch processing must be enabled on the WebCC server. If not, nothing will happen. For more information, see Batch Processing in the Harmony Server Installation Guide to learn how to set it up. NOTEWhen navigating, click the Return to Scene list button in the top bar to return to the main page.